Mathematicians and scientists use experiments to model what happens in avalanches, so they can understand them better. In this investigation, students will model an avalanche, collect data and display their findings with graphs. Put the funnel in the clamp so the funnel points vertically downwards. Put the piece of squared paper on the table so the funnel is pointing down at the middle of the paper. Pour 1 tablespoon or 20g of the chosen avalanche substance through the funnel. Mark the area covered on the piece of paper, and record it as the 1st tablespoon or 20g of the substance. Measure the height of the heap as accurately as possible, ensuring the ruler is vertical. Measure the angle between the piece of paper and the slope of the heap as accurately as possible. Repeat steps 3-6 until an avalanche occurs, recording the number of tablespoons or 20g portions at each stage. Describe the avalanche (see below). Continue with the experiment until the avalanche substance runs out. Make a note of any problems in the experiment, or anything which may have made it less accurate than would have have been desirable. Record that an avalanche has occurred on the area, height and angle results. was it just a small trickle or a large fall or somewhere in between? how far down the slope did the avalanche go? is there anything else you observed? Draw a bar graph to show the height of the heap at each stage, with the number of tablespoonfuls or 20g measured amounts of the substance on the horizontal axis and the height of the heap on the vertical axis. Repeat for the angle between the horizontal and the slope of the heap. Estimate the area covered by the heap at each stage, by counting squares. Then draw a bar graph of area (vertical axis) against the number of amounts of the substance (horizontal axis). On your graphs, label the points at which avalanches occurred. Do the three graphs have much the same shape, or not? How are they similar, how are they different? Can you see any patterns in when avalanches occurred, or does it seem to be quite random? Now look at the descriptions of the avalanches, and try to classify them as small, medium or large events. Are there any patterns in the graphs for the severity of the avalanches? 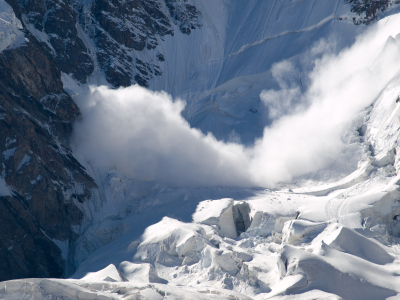 At this stage, it would be good if groups of students make reports on what they have observed about avalanches so far, using their graphs, their observations about when avalanches occur and about how severe they are. There are several ways in which the basic experiment might be extended. Students should start by deciding what they want to investigate, then plan their experiments, making notes on what they will do. Planning should include quantitative information where appropriate. What difference does the size of particle make? What happens if the particle size is smaller/larger? How do the results compare with previous ones? What difference does it make if two or more substances are mixed? How does the mixture compare with what happens with the substances on their own? Does it make a difference if the particle sizes are similar or different? How does varying the proportions of each affect the results? What difference does it make if water is added to a substance? Water should be added in measured amounts, seeing how this affects the results. Which substances had the most frequent avalanches? Which substances had the least frequent avalanches? Which substances had the most severe avalanches? Which substances had the least severe avalanches? Is there a maximum area covered, or height, or angle, for heaps of particular substances? Does the frequency or severity of an avalanche relate to the area of the existing heap, or its height, or the angle it makes with the paper? What difference do you think particle size makes? What difference does the amount of water make? How does it affect things if you mix two or more substances? Do the proportions in which they are mixed matter? What sort of snow is likely to have the most dangerous avalanches - snow with small or large particles? Is wet snow likely to be more dangerous than dry snow, or vice versa? Avalanches happen on snowy slopes. Are slopes with slight (say up to 20°), moderate (say 20° to 50°) or steep (more than 50°, say) likely to be most dangerous? If snow melts then refreezes, making bigger icy particles, and then new, smaller snow crystals fall, what would be predict about the likelihood of an avalanche? Which of these suggestions do you think would be sensible advice to people trying to prevent or at least control avalanches? Which wouldn?t be sensible? Chop down all the trees in case they are damaged by avalanches. Trigger small, controlled avalanches very early in the morning to clear away accumulated snow. Put fences, posts, windbreaks or dams on slopes to divert the avalanches. Grow new trees on slopes to break up avalanches. Build houses on snowy slopes to divert the avalanches. Fire guns in the late afternoon to start an avalanche and clear away accumulated snow. Can you suggest any ideas of your own? Comparing data. Processing and representing data. Collecting data. Chemistry. Interpreting data. STEM clubs. STEM - physical world. Physics. Handling data. Maths Supporting SET.